I’m back with the 2nd edible gift in my little series this month! 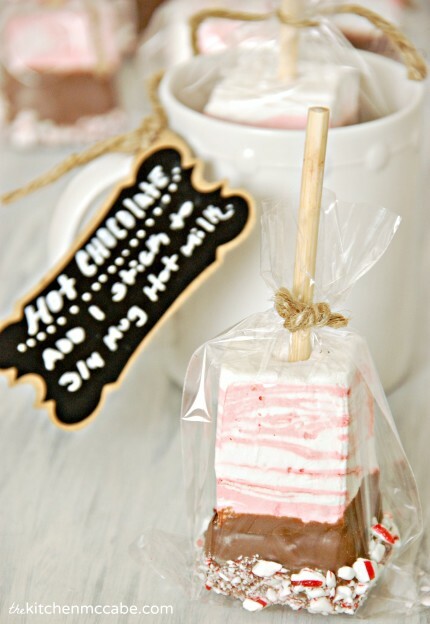 I have always wanted to try this “hot chocolate on a stick” thing and this is the year! I made these last night for a Christmas party and they were a hit! 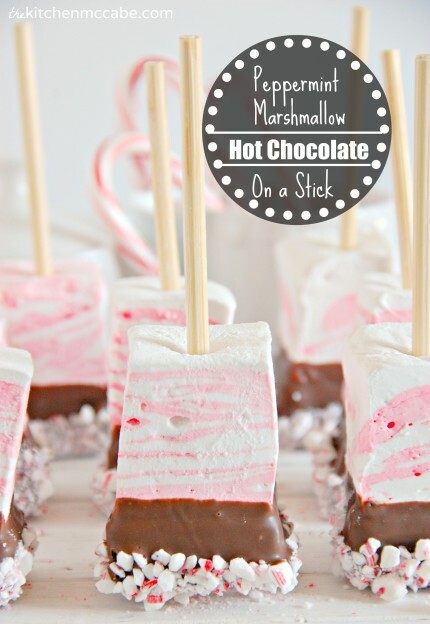 We had a little hot chocolate bar where we set out a crockpot full of hot steamed milk, empty mugs, and these peppermint marshmallow hot chocolate stir sticks(salted caramel chocolate sticks as well, but that’s a post for another day ;)). No, these aren’t a super simple quick treat(are they ever over here? Haha), but they make a mean cup of cocoa. And they look nice too! Homemade peppermint marshmallows on top, chocolate ganache on the bottom, all dipped in chocolate and rolled in crushed candy canes. These sticks are perfect for a holiday party, particularly in the frozen winter wonderland that is my home. Have you ever tried making homemade marshmallows? They really are pretty easy to make(albeit quite messy). And once you try them, you’ll never want to buy them again. 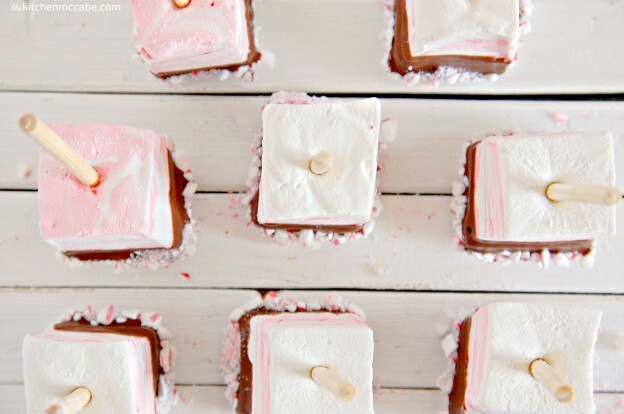 Homemade marshmallows are so customizable! 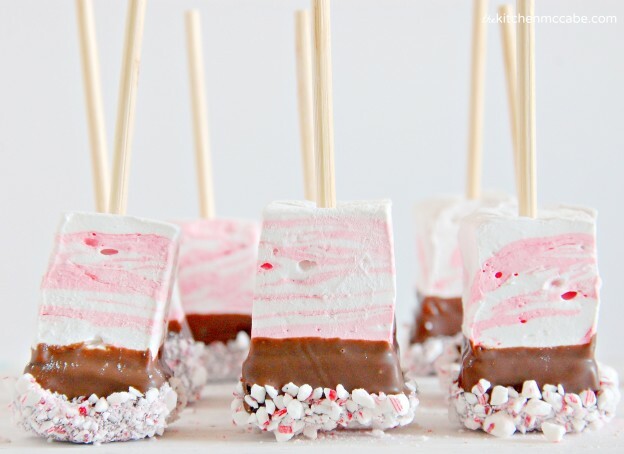 I added peppermint oil and red coloring to make these peppermint marshmallows, but you could make so many other types. I want to try some orange infused mallows next time I make them. 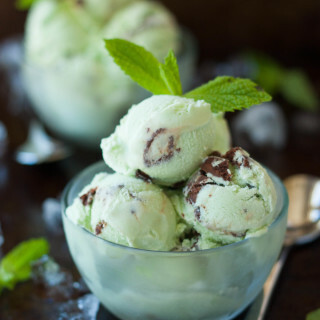 This recipe is one I found on Epicurious years ago and have modified slightly for this treat. It turns out great every time! 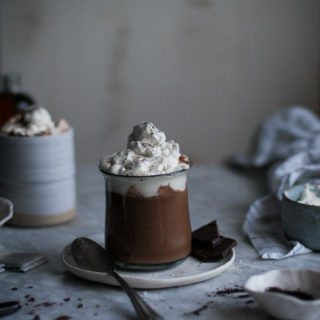 Place a hot chocolate stick in a mug. Fill the mug full of steaming hot milk(I use whole for creamier hot chocolate). Don’t fill it too full! 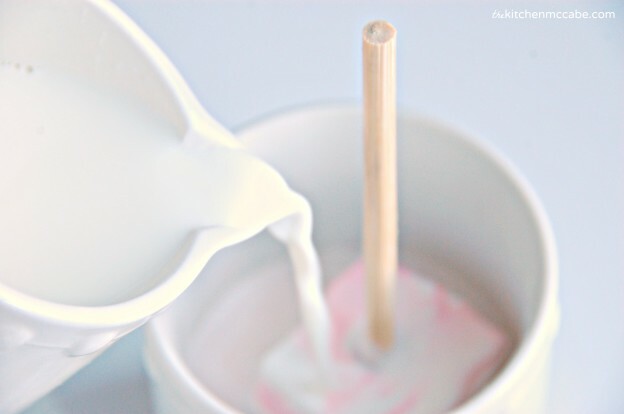 The marshmallow will melt and foam, causing your milk to overflow if there is too much. Let that cube of holiday cheer sit in the hot milk for a minute or two. Then stir it up well. 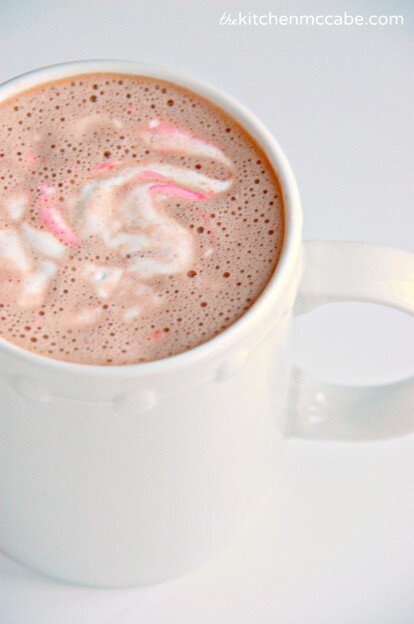 Enjoy your cup of peppermint hot chocolate complete with foamy marshmallow topping! Also, these make the perfect little Christmas gift! 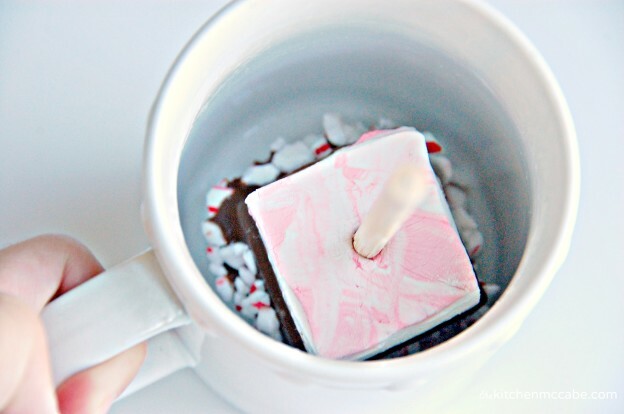 Wrap the marshmallow sticks up in little treat bags, tie with twine and gift them to your neighbors and loved ones along with mugs and a little chalk board tag instructing them on how to make their own cup of hot chocolate! 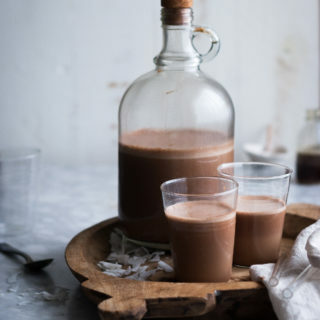 I am guest posting today over at the fabulous Just-Between-Friends.com, so head on over HERE to get the ganache recipe for these fun Holiday treats! Ready a surface to place your chocolate dipped marshmallow sticks on(I use a silpat mat). Turn the chilled ganache out onto a large piece of parchment paper. Cut any sloping sides off of the ganache(using a hot, wet knife) so that all edges of the ganache are straight. 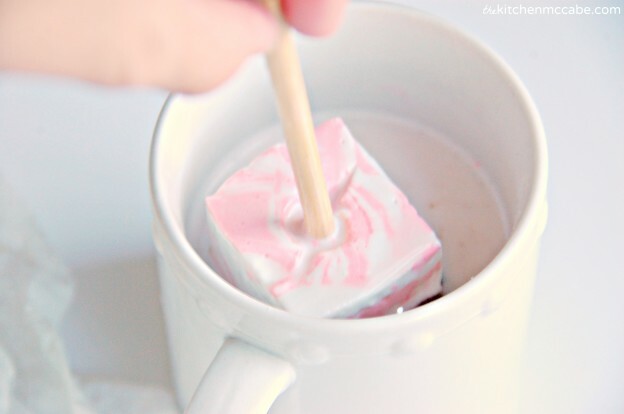 Insert a wooden stick into a marshmallow so that the top of the stick goes all the way through the mallow and sticks out at least 1/2″ through the other end. Place the marshmallow on top of the chocolate ganache so that the corners of the marshmallow and ganache line up and the 1/2″ of exposed wooden stick is pressed down into the ganache. Repeat this with the other marshmallows, lining up the marshmallows on the ganache so that sides of each marshmallow are almost touching. Using a hot, wet knife, cut down through the lined up marshmallow sticks so that you are cutting squares of ganache that match up with the marshmallow square on top. Remove each marshmallow/ganache square as you cut it to another sheet of parchment. Wipe off or rinse the knife after each cut. When you have finished cutting the ganache into squares, you can dip them in chocolate. Dip each square in melted chocolate so that the chocolate totally covers the ganache and comes up to the sides of the marshmallow. 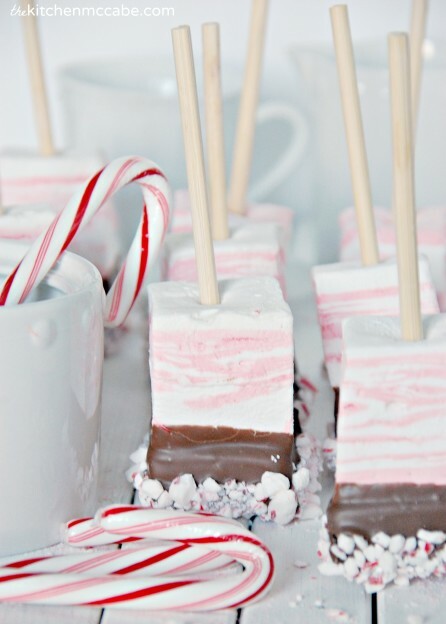 Carefully tap off the excess chocolate and place the marshmallow stick on a plate of crushed candy canes. Push the crushed candy canes up around the chocolate. Remove the stick and place on your non-stick mat(or parchment) and allow to set up. Repeat this with the remaining marshmallow/ganache sticks. Add vanilla and peppermint oil(5 drops will give you a strong mint flavor) and beat to blend, about 30 seconds longer. Scrape ½ the marshmallow mixture into prepared pan. Add the red coloring to the remaining marshmallow and whisk again, just until the color is mostly blended in(red streaks are ok).